"Once Lord Shiva and his mates (Gods) were on a pilgrimage to Kashi. On the way, it became dark and everyone decided to rest for the day. In the morning, everyone except Shiva was fatigued by the journey and were not ready to leave. So, Shiva in his restlessness decided to go alone by cursing all of his mates to become rocks". Hence, the name 'Unakoti' which means one less than a crore. Well, together they were one crore travellers! Unakoti is as fascinating as this legend; beautifully carved rocks and murals perched on scenic hill complete the picture. A voyage for about 145km from Agartala takes you to Unakoti. The rock-cut sculptures dates back to 7th - 9th Century. The rock carvings look like a painting in the green canvas. 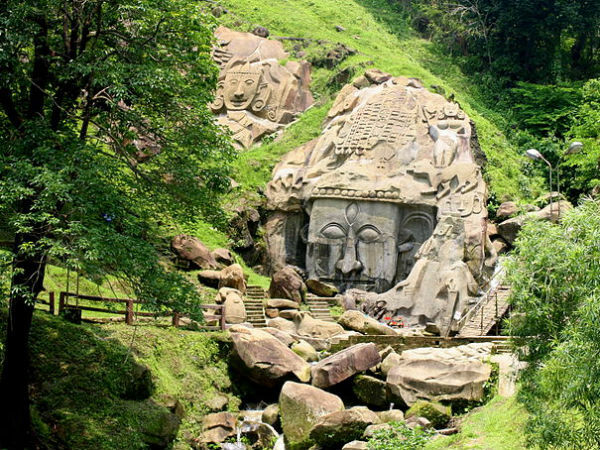 Unakoti is one of the prominent tourist places and a Shaiva pilgrimage site in Kailashahr, Tripura. The main idol of Unakotishwara Kal Bhairava is an enchanting masterpiece among the other models in the vicinity. Majestic Ganesha and three images of Bull near the Shiva have a beauty of their own. Folklore has another story about the chiselled structures. It is believed that a sculptor called Kallu Kumar is said to have carved the idols as he was a great devotee of Goddess Parvati. The tribals say that Kallu Kumar wanted to go with Lord Shiva and Parvati to Kailash. Upon his request, Lord Shiva agrees on a condition that he carves one crore sculptures in one night. In the morning, one less than crore sculptures are done. So, Shiva leaves Kallu Kumar and goes back to Kailash. Folklore and legends only make the places more exciting. However, they don't strike a direct connection with the destination. Unakoti is now recognised as a heritage and is preserved by the ASI. Sadly, many carvings have weathered out over time. Still, an artistic place such as this should be given more importance on your tour to Tripura. Many people gather here annually during the celebrations of Ashokastami Mela (fair). Tourists can take a bus from Agartala or Tripura to reach Kailashahar. Unakoti is around half an hour from Kailashahar. People going by train should get down in Kumarghat and take other transport to Kailashahar.